The multi-compressor Brine Chiller satisfies all the needs for secondary refrigerant application in the negative range of temperature. The compressors are mainly available in three models: hermetic, semi-hermetic and hermetic scroll. 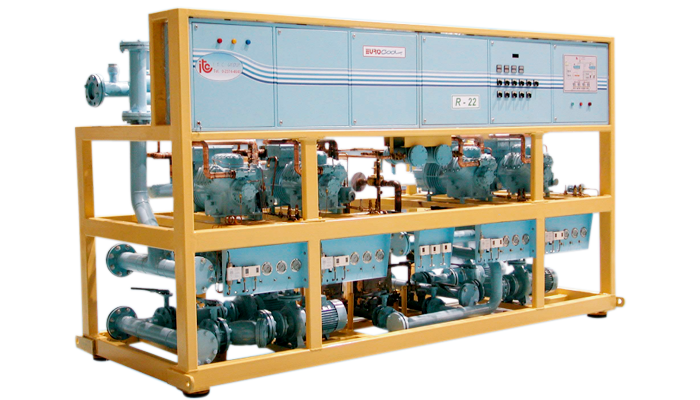 Compressors with rotalock valves in suction and discharge, crankcase heaters and sight glass. Oil distribution depending on the range for instance through manifold, through mechanical or electronic type oil level regulation. Liquid line with dehydrator filter, sight glass. Socket with shut off valve for Suction and Discharge pressure gauges. Safety devices: low and high pressure switches, compressors internal protection, thermal protection. Electrical panel IP45 protection giving with devices for compressor racks management. Compressor racks with different refrigerant and with screw compressor can be designed by our technical department.